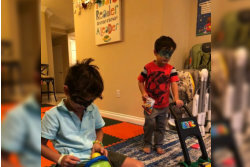 Here at our Childcare Center in Irvine, California, children have a free time to play and do whatever they want in the morning when they arrive and before breakfast is served. We believe that children should roam around, explore, and discover things and interests on their own. As such, our reliable and responsible staff members will start to work as soon as the first student arrives, making sure that our students remain safe in the classroom and playground. Rest assured that they will supervise and can ensure you a compassionate, exceptional care for your little one.